Basic Structure of Hair (PDF) – All hair, whether from human or animal origins, has the same basic components. This easy-to-follow handout will explain the physical qualities of hair, how it grows, and how to determine different types of hair. What is Human Hair? : A Light and Scanning Electron Microscopy Study – Not all human hair looks exactly the same. This study from Rochester University examines the differences between three different types of human hair. Trace Evidence: Hair and Fiber (PDF) – While this handout was designed for a forensic science course, it nevertheless provides an excellent starting point for understanding the structure of hair. It also explains how to “read” a hair to determine where it came from and any clues it may provide to investigators. Hairs – If you’re looking for a quick overview of hair, this is the article for you. In just over three paragraphs, Dartmouth Medical School provides a comprehensive look at some of the most important facts about hair. Isotopic Comparison of Hair, Nail, and Bone (PDF) – Strands of hair feature large amounts of a protein called keratin in their structure. This report from the Journal of Archeological Science demonstrates how the different keratin levels can help determine the origin of a sample. The Chemistry of Synthetic Hair Fibers – Not all hair recovered from a crime scene is human in origin. It may come from a dog, a cat, or an expensive wig, but this article from Yale University can help explain the differences between synthetic and naturally-produced hair. Hair and Nails – Hair and nails share many characteristics. On this web page, the structure of both is addressed and clarified. Chemical Composition of Hair (PDF) – The pigment melanin is responsible for hair color. By understanding what chemicals are found in hair and what effects they have, scientists can more accurately study hair samples and gather useful information. Elemental Composition of Hair and its Role in Forensic Identification (PDF) – Hair can make or break a criminal case. This paper explains how the chemicals in hair can help answer questions that would have otherwise been impossible to solve. Forensic Hair Comparison: DNA Analysis of Hairs – Both nuclear and mitochondrial DNA can be recovered from hair samples. The Federal Bureau of Investigation has an article addressing the usefulness of testing DNA recovered from hair and a quick overview of the distribution of DNA within a hair. How DNA Profiling Works – Whether it’s nuclear or mitochondrial DNA, the process that scientists use to analyze it is the same. This article from Wisconsin’s Magazine for the Life Sciences explains DNA profiling from start to finish. 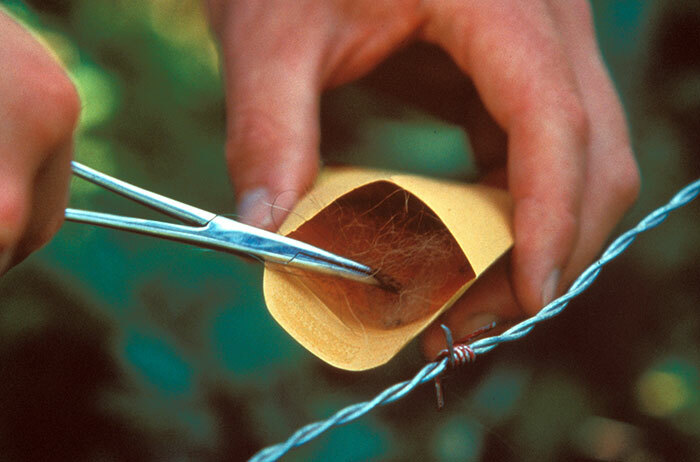 Hair Suitability for DNA Testing – To test a hair for nuclear DNA, the hair must have tissue attached to the root end. If there is no root tissue, then the alternative is to test for mitochondrial DNA found within the shaft of the hair itself. Cat Hair Helps Solve a Murder – Not all hair samples recovered from a crime scene are human. However, all hairs have the same basic structure, and in this case, mitochondrial DNA from the shaft of a cat hair proved crucial in bringing a killer to justice. Analysis of DNA in Hair Fibers (PDF) – We know that DNA can be found in hair, but where in the hair is it exactly? This paper from the Journal of Cosmetic Science demonstrates where DNA can be found in a sample of hair and how frequent washing can severely reduce the amount of recoverable DNA. How to Extract DNA from Anything Living – Extracting DNA from hair is a delicate process that requires special equipment. A simple at-home experiment can demonstrate the basics of DNA extraction from biological material. DNA Analysis of Hair (PDF) – Did you know that mitochondrial DNA can only be inherited maternally? From the anatomy of hair to a comparison between nuclear and mitochondrial DNA, this resource is an excellent introduction to the forensic science of DNA extraction. DNA Identification in the Criminal Justice System (PDF) – Nuclear DNA has many uses, but its most popular by far is its role in the criminal justice system. This article from the Australian Institute of Criminology explains the science behind DNA profiling and its use in criminal investigations. DNA Evidence: Basics of Analyzing – Like all types of DNA, the DNA recovered from the nuclei of cells must undergo several processing steps before it can be analyzed. The National Institute of Justice has a page explaining the entire process of nuclear DNA testing. I-DNA-Fication, Personal Privacy, and Social Justice (PDF) – Nuclear DNA has been used and proven repeatedly in courts of law. This new technology does not come without controversy, as demonstrated in this paper from the Chicago-Kent Law Review which details the potential ramifications of a world without DNA privacy. Missing People, DNA Analysis, and Identification of Human Remains (PDF) – Nuclear DNA has served many purposes on the battlefield. Whether it’s identifying human remains or helping to locate lost family members, nuclear DNA testing helps put names to the faces of war. Mass Fatality Incident Identification Based on Nuclear DNA Evidence (PDF) – One only has to turn on the news to hear of a plane crash or a building collapse. Nuclear DNA is a popular tool to help identify the remains of the victims and provide a degree of closure for the families and friends left behind. DNA-Based Technologies (PDF) – Nuclear DNA doesn’t just assist forensic investigators. A vast crop of new technology based around DNA has sprung up over the past few years, reaching past crime scenes and into the barnyard. A Nuclear DNA Unit – Every piece of evidence recovered needs to be processed. Take a look at the Nuclear DNA Unit of the New Jersey State Police for an explanation as to how nuclear DNA is used and what must be done to extract it. Using DNA to Solve Cold Cases (PDF) – DNA testing has advanced drastically over the past twenty years. This guide, provided by the US Department of Justice, explains how trace DNA, recovered from samples like hair, can help solve questions that were never answered. Mitochondrial DNA Analysis (PDF) – Mitochondrial DNA, even in a very small or badly degraded sample, can help investigators make a positive ID on a body or biological sample. This presentation explains the different characteristics of mitochondrial DNA and how scientists can analyze it. Mitochondrial DNA and Ancestry (PDF) – Until the 1990s, nuclear DNA testing was the only option available to investigators. Mitochondrial DNA can determine the ancestry of an individual and can help paint a clear picture of human migratory patterns in the past. Mitochondrial DNA Testing on Hair – This short but informative article from PBS explains the properties of mitochondrial DNA. It also addresses the shortcomings of mitochondrial DNA testing. Investigation of DNA Extraction from Hair Shafts (PDF) – Mitochondrial DNA is generally viewed as a less reliable source of DNA, given that it can more easily be mishandled or contaminated. In this paper, three different methods of mitochondrial DNA extraction are presented, tested, and addressed in order to determine the best way to handle this form of DNA. Ancient Mitochondrial DNA from Hair (PDF) – Before mitochondrial DNA testing, ancient hair samples were largely useless for DNA testing, since the DNA-rich root tissue had long since disintegrated or deteriorated. However, the use of mitochondrial DNA is opening new doors in anthropology and forensic science. Improvements to the Forensic Analysis of Mitochondrial DNA Typing (PDF) – Science is continually advancing, especially in the field of forensic analysis. This paper presents some of the latest innovations in the world of mitochondrial DNA. A Simplified Method for Mitochondrial DNA Extraction from Head Hair Shafts (PDF) – Mitochondrial DNA extraction and testing can be much more expensive than the same required for nuclear DNA. Fortunately, there’s new research that suggests the process could be streamlined by the inclusion of an alkaline solution. The Titanic’s Unknown Child: DNA Helps Solve a Mystery (PDF) – The sinking of the Titanic in 1912 saw 1,500 people lose their lives to the icy water of the Atlantic. One of them was a two year-old boy, buried under a nameless grave until mitochondrial DNA testing helped bring his identity to light. Three Decade Old Murder Mystery Solved with Hair – Thanks to the advances in DNA testing, crimes from decades ago are continually being solved. In this instance, the hair found in the victim’s hand helped identify the murderer. Murder Case Solved with Dog Hair – Hair doesn’t have to be human to help solve a case. In this instance, the hair from two dogs was what led investigators to the door of a criminal. Hair Comparison Evidence (PDF) – The dark side of DNA testing is the fact that it can be misused or misread, leading to the conviction of an innocent individual. This paper examines the successes and failures of DNA obtained from hair samples. The Impact of DNA on Policing – Even though DNA is used in only 1% of crimes, the results have been staggering. The Police Chief Magazine has an article explaining how DNA has changed the past, present, and future of law enforcement. The Effects of DNA Databases on Crime (PDF) – Larger DNA databases have been proven to reduce the rate of crime across the United States. For a full report, check out this article from Tulane University. Using DNA to Solve Crimes – While the world of DNA testing does have its issues, the practice on the whole has been invaluable to the justice system. This report from the US Department of Justice offers a clear overview of the state of DNA testing today. DNA Typing Now and Before – DNA testing can be an invaluable resource for forensic investigators, but it can also be easily contaminated or misread. The University of Texas has an excellent article detailing the potential pitfalls of DNA typing. First Mitochondrial DNA Test in Criminal Trial – Mitochondrial DNA was first used as evidence in a criminal case in 1996. There is still controversy regarding the reliability of mitochondrial DNA testing, but in this case, it provided the evidence necessary to win a trial. Hair Analysis that Could Compliment Crime Scene DNA Identification – Recovered mitochondrial DNA can help rule out or implicate a suspect, but it might be able to give a general overview of the person it was taken from. A new method in forensic science could give investigators key details about the owner of a biological sample.